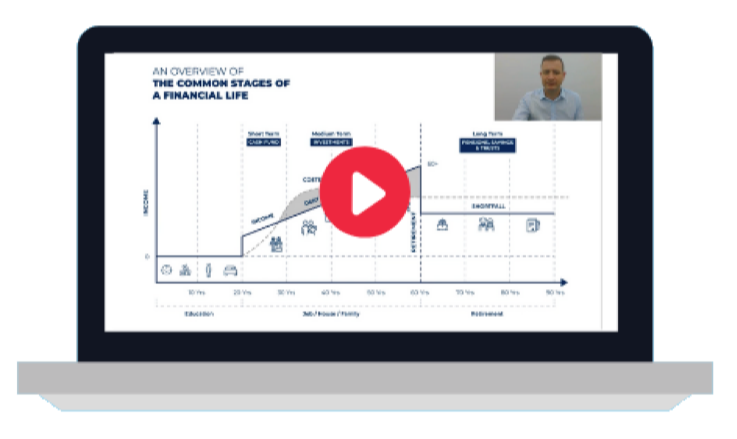 Thank you to Andrew Hallam, bestselling author of The Millionaire Teacher and The Global Expatriate's Guide to Investing, for allowing us to publish this post. Assume that you, and everybody you know, must pedal a bicycle 50 miles. You could choose to ride uphill. It takes a lot of effort and you might not get as far as the final distance. Or you could choose a flat stretch. It’s a lot easier to cover 50 flat miles. 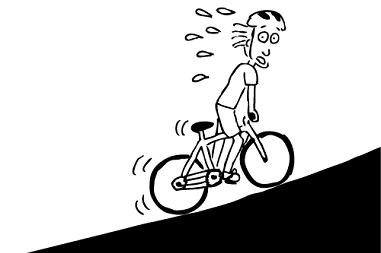 Most people, if they ride like they invest, head straight up massive climbs. But, as one of my friends found out, there’s an easier route to take. He just wishes he had taken it. My friend is a doctor. I’m a teacher. He earns much more money than I do. Over his lifetime, he’ll save twice as much as me. But here’s the magic paradox. Unless he wins the lottery, I’ll always have more money. He chose the delayed uphill ride. I chose to ride an early, flat road in a valley. I started to invest when I was nineteen. 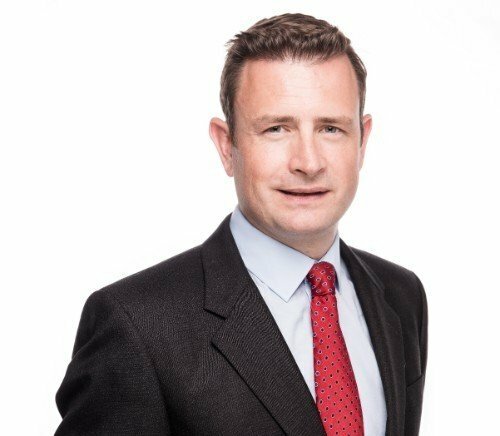 He started to invest when he was in his 30s. When it comes to investing, time is your friend. It lets compound interest perform its miracle. Those who invest when they’re young can make up much more ground with a lot less effort. I tried to share this lesson with my friend's daughter, Katie. Katie could spend more money than her friends and end up wealthier. But she would have to start investing now. If Katie invested $5 a day ($150 a month) and bumped that to $15 a day by the time she’s 25, she would have saved $177,025 by the time she turns 55 years old. If she invested her monthly savings in the S&P 500, she would have much more than that. Vanguard’s S&P 500 averaged a compound return of 9.8 percent per year over the past 30 years, ending May 6, 2016. Let’s assume that it averages a compound annual return of 8.8 percent over the next 37 years. It could earn more. It could earn less. But it should make something close. Katie’s $5 per day, which she would bump to $15 per day at age 25, would grow to $1,010,250 by the time she’s 55. That’s a million dollar tailwind on a lovely flat road. Most of Katie’s friends won’t save until they’re older. Somewhere ahead, they’ll have to cover thigh-burning miles over a financial Muro Di Sormano. A climb made famous as one of the most severe of any road cycling race. Imagine them starting to invest at age 35. Assume that they bust their butts to invest $17,000 per year. It’s also 3.1 times more than Katie would be saving. If they also average an annual return of 8.8 percent, they would have $925,281 by the time they’re 55 years old. 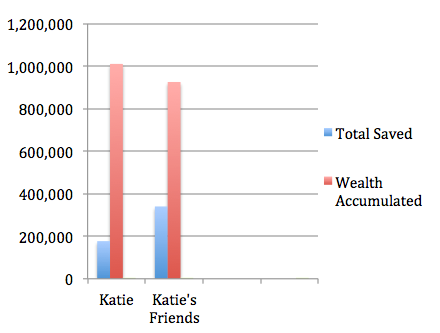 Even counting the money that Katie added earlier, her friends would save twice as much. Between the ages of 25 and 55, Katie could buy better cars, take nicer trips, and spend more money on the things she enjoys. She would still end up wealthier than her hill-climbing friends. Of course, there’s always a chance that Katie could ignore me. I hope she doesn’t. World champion cyclist Ercole Baldini’s quote hits hard when I see the tougher path.